Learn the cost of getting HughesNet in your home and which plan is right for you! How Much Does HughesNet Cost? If you live in an area with slow DSL or dial-up service, HughesNet satellite Internet is a great option for you! Its available from coast to coast, reaches all rural and remote locations, and offers a fast and steady 25 Mbps download speeds on EVERY plan. This is more than enough speed to do all of the things you love to do online. 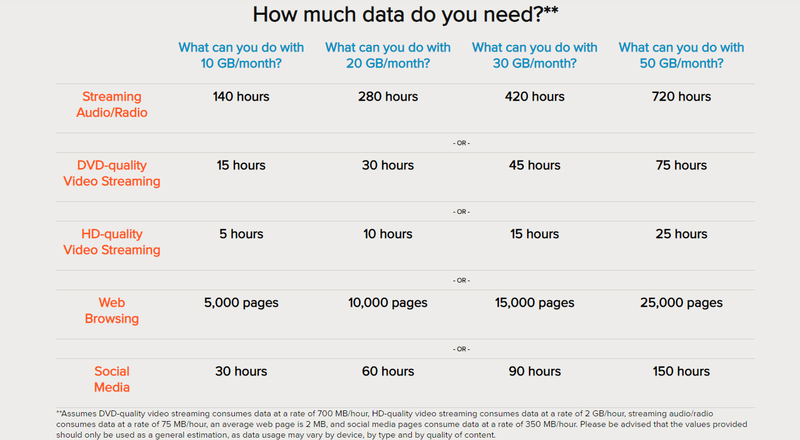 HughesNet offers 4 great plans, each having a different amount of anytime data. The 10 GB plan retails for $49.99/month, the 20 GB Plan retails for $59.99/month, the 30 GB Plan retails for $89.99/month, and the 50 GB plan retails for $129.99/month. Depending on your address, you can receive promotional pricing and discounts for each of these plans. To set what’s available at your home, we recommend using the address lookup below. What HughesNet plan is best for me? The chart below will give you an approximation of what you will be able to do with your anytime data on the plan you select. In addition to anytime data, every HughesNet plan comes with 50 GB of Bonus Zone Data which can be used from 2am to 8am local time, as well as no hard data limits. This means that even if you exceed your monthly anytime data allowance (10, 20, 30, or 50 GB), you stay connected at reduced speeds, typically 1-3 Mbps, until your next billing cycle. Get the fastest satellite Internet service—25 Mbps1—available to anyone, anywhere. Surf the web faster; download files quicker, and access media like never before! HughesNet offers a variety of affordable Internet plans that are built to suit any budget, and are available where you live today, even in areas with slow or no high-speed options! HughesNet uses satellite technology, freeing up the phone line for more important things, like making phone calls! Plus theirs no need to dial in – HughesNets always on.